In a week when the dangers of plastic waste have been weighing heavily on the nation's conscience, the London Marathon continues unabated. This annual environmental catastrophe ravages the capital, blocking the streets and littering them with hundreds of thousands of plastic bottles. Yet the authorities continue to turn a blind eye. When will this madness cease? 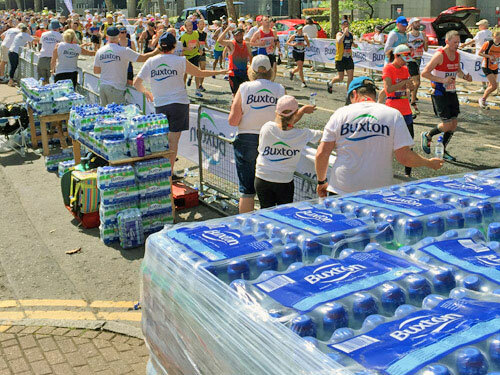 I undertook surveillance beside one of the many rehydration stations and watched, aghast, as tablefuls of bottled water were thrust in front of weary runners. They grasped them gladly, guzzling down the refreshing liquid, then hurled them to the floor without a second thought. Mountains of discarded bottles at the kerbside told their own scandalous story. 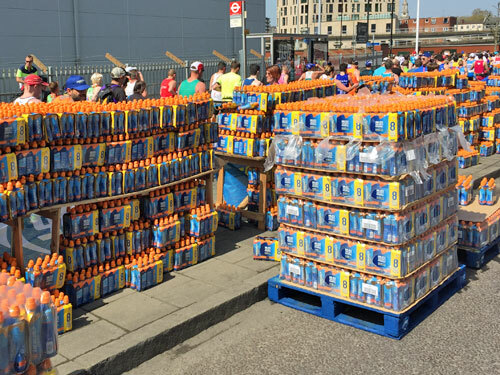 What's more, most of the runners failed to drink the entire contents, thereby wasting the not-inconsiderable resources that had gone into each bottle's production. As I stood there open-mouthed, several water-filled missiles were hurled towards me, spilling out their contents before evaporating on the pavement. Somewhere in the Pacific a porpoise choked on a plastic lid. The main culprit was a greedy drinks company who had paid a considerable sum to despoil the race. Even the sign which would normally have said "Water station" had been replaced by the name of a market town in Derbyshire, explicitly linking their toxic brand to the death of wildlife worldwide. Council operatives struggled to contain the mountains of discarded rubbish. The ecological savagery inflicted by an infamous 1920s sugar-based drink was even worse. Competitors seemed less willing to consume an entire bottle of this orangy liquid, casting pallets-worth into the gutter after barely a couple of gulps. Perhaps they were scared of the decay 13.7 grams of sugar would cause before they were next able to brush their teeth. No other types of liquid, in any kind of sustainable packaging, were available. None of the athletes had had the foresight to bring their own water in reusable non-plastic bottles. Nobody, it seems, had considered the practicality of installing drinking fountains around the course. Where were the ecologically engineered water reclamation and reuse solutions? Scandalous amounts of waste were conspicuous elsewhere. Unnecessary motivational placards had been made from timber-based sources. Spectators had travelled from all across the country, generating an astronomical carbon footprint. Charities had manufactured thousands of inflatable plastic tubes on the off-chance that families might take them home and set up a direct debit. Beer drinkers stumbled out of pubs clutching superfluous plastic glasses. Appalling levels of skin damage were being inflicted by unseasonable solar radiation. T-shirts bearing inspirational messages had been purchased even though they could only be worn once. Balloons attached to mileposts contained a not insignificant proportion of the world's remaining supply of helium. The chief sponsor was a company which irresponsibly propels metal tubes through the upper atmosphere. Public transport was being hindered, diverted or curtailed. Members of the emergency services stood around wasting valuable resources which would have been better focused on civilians in genuine need. 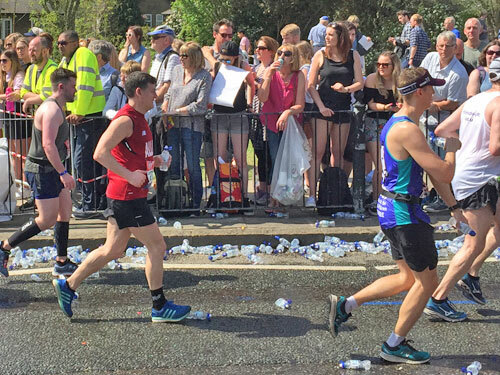 Runners collapsed in front of their applauding parents, then struggled to continue, causing irreparable long-term damage to their mental well-being. 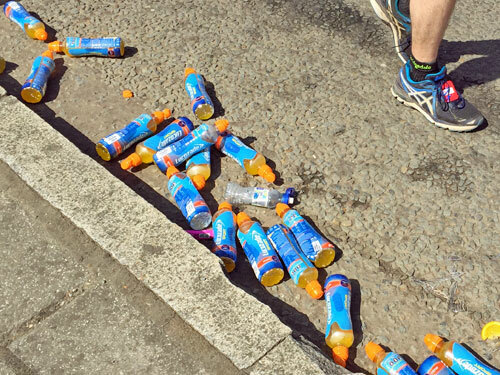 Sure, the London Marathon earns millions of pounds for deserving causes each year, but at what collective cost? We should end this annual charade and all give thirty quid to charity instead, flashing our own plastic to save the planet.